Welcome to the 22nd issue to subscribers of Right Writing News. This issue in particular emphasizes book proposals and will provide various opportunties to learn about this critical aspect of book publishing. If you are reading this issue forwarded from someone, be sure and use the link below to get your own free subscription. 6) What's Your Book About? 8) What Are People Saying About Book Proposals That Sell? On Thursday, October 26th, I will be chatting for two hours at the Institute of Children's Literature. The topic is book proposals and how as writers submit better proposals, then they will improve the results from their submissions. If you can, join us for the chat. I recommend you go to the chatroom ahead of time to register (free) then participate. Also you can email some questions ahead of time to Jan Fields at WebEditor@institutechildrenslit.com. If you are reading this article after October 26th, the transcript for this chat are stored online. These archives are a rich resource of writing information on a variety of topics from many different participants. In the past, I've been in this chatroom--in fact three times (one and two and three in two parts) but Thursday will mark the first time talking about Book Proposals That Sell. I hope to see you there. If you'd like to get some regular writing information, I'd encourage you to use this form and subscribe to any updates from the Writing Life (my blog which has over 500 entries and is searchable). 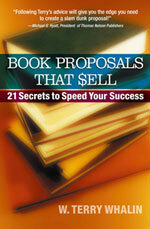 Several months ago on Annie Jennings PR, I recordered a free tele-seminar about Book Proposals That Sell. This teleseminar covers the major points of the book in a free MP3 file. Follow this link to download the teleseminar. Several months ago, Stacy Harp, president of Mind and Media, interviewed me about Book Proposals That $ell. If you've not seen Stacy’s blog, I'd encourage you to take a look because of her interesting view of the media and books. The interview is still available and you can download the thirty-minute interview at this link. Even if you've heard me teach about book proposals, the interview gives some recent examples and illustrations to some of the points of the book. It’s a way to gain some additional insight on this important topic. If you've read and studied the book, it will give you some reminders. Before I began working inside a book publishing house, I had written more than 50 nonfiction books, ranging from children's to adult books. I have never self-published a book and always worked through traditional publishers. However, I was unaware of the financial production numbers for nonfiction books and I found it shocking--and something critical for potential authors to understand. The author never sees these figures for their books as the publisher doesn't reveal them throughout the contract negotiation process. A publisher will produce these financial calculations as simply a part of good business practices. As an author, understanding this helped me see publishing as a business. Authors have huge amounts of time and emotional investment in their words. When I saw these production numbers, I understood that the publisher, not the author, has the largest out-of-pocket cash investment in a book. Inside the publisher, the editor will gather a sales projection about how many copies the sales department believes they can sell of your title the first year. That sales figure will be used to calculate the production costs of ink, paper and binding for various amounts of printing (5,000, 10,000 or 15,000 copies). As the initial print number is raised, the cost per book decreases. You may ask, So why not print a large volume each time? The answer is, if the publisher prints a large number of copies, then he has to store those copies in their warehouse (read cost and expense), plus make sure they actually sell those copies within a year's timeframe. The cost of tying up financial resources in storing and warehousing books that aren't selling is large. Also the federal government taxes publishers on each copy in storage. These tax rules have forced publishers to think long and hard about how many copies of each book to print. Inside my former publisher, we calculated the overall printing details of the book (paperback with general publishing look or hardcover with jacket) and the number of books to print before offering a book contract. In short, publishers pour a great deal of work into their books and financial projections before they call you and offer a nonfiction book contract. Understanding this process helps you see some of the reasons it takes such a long time for an author to receive a publishing contract. Often the publisher returns to an author with whom they have already published a book. If the publisher takes a second or third book from the same author, they are investing in that author's career and trying to build that author's audience and market. If the author's books are selling well, then the publisher will be eager for another project. Each week, publishers monitor sales numbers on their books to see if particular authors merit another book contract. Many writers focus only on the creative aspects of writing a book and getting it published, but the executives inside a publishing house are business people who want to sell books and turn a profit at the end of the day. It's a delicate balance between creating the best possible product and assuring that each product has the best opportunity to sell into the market and reach the target audience. W. Terry Whalin has written more than 60 nonfiction books and has also worked as an acquisitions editor for Cook Communications and Howard Books. He is the creator of a website to encourage writers at: www.Right-Writing.com. A popular speaker at conferences, Terry and his wife, Christine, live in Scottsdale, Arizona. I could feel the intensity increasing among the other editors involved in acquisitions. I felt it as well because we were facing a deadline to turn in our material for the next publication board meeting. We typically set deadlines several weeks in advance of the actual meeting, then the various participants could read our background materials before the meeting and come prepared with their questions and comments. Besides the author's proposal, we had internal documents to get ready for the meeting. An editorial assistant prepared an agenda which gave the order for the editors to present their books for that particular month. Tensions in our editorial group always tended to run high the day of the publication board meeting as no one could predict what would happen in these sessions. There is an old saying about editors that it depends on what they had for breakfast. Reality isn't that subjective but the mood of the room can swing to different extremes. For some meetings, the questions were minimal and the reaction was positive about the authors that I championed for the publishing house. On other occasions it was different. I walked into the room filled with publishing staff, armed with my stack of folders and paperwork. As an editor, I prepared a series of short presentations on the key details of each book. Another editor on our editorial team had worked at multiple publishing houses and appeared before different groups of these publication boards. This colleague told me, "Our publication board is different and a bit crankier than some of the others." Waiting for your turn in the room can be a nerve-racking feeling for an editor. Finally my turn came and I walked into the large board room. Key leaders from the publishing house--including sales, marketing and editorial personnel--sat around a conference table. It was almost certain that several of these leaders had only skimmed your paperwork or not read it at all or they read it during your presentation. Some days it was like sitting on the hot seat trying to defend your titles to a room full of skeptics. Other times they were supportive of your selections. As a book is accepted for publication in this meeting, the various groups such as sales and marketing are held responsible for their support of a particular title. Key business decisions for the life and future of the publisher are made in these meetings. You, as the author, aren't present but your view is represented from your work on the book proposal and the voiced words of support from your acquisitions editor. Your words on your proposal become elevated in importance. How will your book be represented through your words? What is the hook? This should come in the first sentence or two of your overview--the first section for any book proposal. This section defines the topic of your book in a few words. I've already explained the difficulty involved in getting an editor to read your material. Now you have a few seconds to grab the editor's attention. What hook will you use to entice him to keep turning your pages? Your first responsibility is to reach the editor who is thinking about his readers and book buyers when he reads your initial words. He can then use your overview material to hook his publication board. The overview should be a maximum of one to three pages in length and should clearly explain what the book is about, why it is necessary and what makes this book different than others on the same topic. Normally this material is written in the third person. If you are looking for a way to concisely tell the idea of your book, I'd suggest that you first write it on paper, but also work with it in an oral format. It's one of the reasons to read your writing aloud after you've finished it--because the ear is less forgiving than the eye. Using this process, you will pick up on all sorts of ways to improve your manuscript. By Dennis E. Hensley, Ph.D.
My friend Virginia Muir, former managing editor at Tyndale House Publishers, was once accosted by an irate writer whose proposal had been rejected by Tyndale. "All right, so maybe my proposal had a few rough edges," barked the young writer. "But couldn't you have fixed it up a little bit for me?" Virginia shook her head. "We are hired to heal the sick," she said, "not raise the dead." #1 Proper Elements. "The standard package has not changed much over the years regarding book proposals," says Peter Rubie of the Perkins-Rubie and Associates Literary Agency of New York. "A cover letter should include the author's qualifications for writing this particular book, a brief description of what the book is about, a projection of when the manuscript will be completed, some discussion of who the target readers will be, and an explanation of whatever the need is that the book will meet. Some companies also like a one or two page synopsis of the plot to be included." Rubie adds, "Send along an annotated table of contents which lists the title of each chapter and then provides a one or two paragraph summary of what will transpire in that chapter. Editors expect also to receive at least two completed chapters so that they can judge the writer's ability to write dialogue, handle leads and closings, develop characters, and create plot (or provide support data for nonfiction books)." #2 Neatness. You only get one chance to make a good first impression, so it had better be your best effort. Dog-eared pages, erasure smudges, strike-overs, faded ribbons and correction fluid smears are sure indications that the manuscript has been passed around. Make sure that the manuscript smacks of professionalism. Use #16 or #20 weight Bond white paper, and be sure to have an ink cartridge in your computer printer that is full and dark. #3 Reader Sensitivity. "To me," says John R. Ingrisano, president of Poetic Press, "a book proposal needs the smell of gunpowder. Readers need to feel an author has been in the battle, that he knows first-hand what he's talking about. It's easy to see through a fraud. He'll say things about a topic that no one who's been involved in it would ever say. Readers want sensitivity and identity from authors, not aloof judgments or unbending mandates." #4 Good Writing. Most writers will make an effort to have exact spelling, proper punctuation and correct grammar in their book proposals. Unfortunately, that doesn't guarantee that their writing will be clear. Acquisition editor Steve Laube of Bethany House Publishers notes, "When book proposals come in, the sample chapters often have redundancies, fluff and padding. I like to see clear messages, straight-forward writing, and well organized structuring. Prose that needs paring isn't going to impress me." #5 Organization. "Book proposals need a clear sense of organization," says Rich Willowby of Warner Press. "There needs to be a logical progression from one event to the next. I often make my authors ask of themselves, 'What is it I'm trying to accomplish in this book?' I then make them summarize the whole book in one paragraph. After that, if there is anything in the book that doesn't fall in line with those early-established guidelines, it gets cut. This keeps the book on target and organized." Mr. Willowby suggests that writers should prepare a solid blueprint for a book via the annotated table of contents. This will map the book's direction and pace and will organize the information or plot. #6 Publisher Familiarity. The author should be familiar with the kinds of books each publishing house specializes in. If a house specializes on a particular market (children's books, college textbooks) or has a particular theological bent (Baptist, Catholic) or specializes in a distinctive line of books (romances, mysteries), the author should be well aware of this prior to sending in a book proposal. "It's easy to gather a lot of information about a publishing house," says Pamela G. Ahearn, director of the Ahearn Literary Agency of New Orleans. "Write for the publisher's Guidelines for Writers. Study the company's catalog of current and back listed books. Go to the library and check out books published by that company and read them for style and content and market focus. Go to writers' conferences and meet one on one with editors from that company and discuss the company's current and future manuscript needs. Be informed." #7 Market Positioning. In a cover letter of a book proposal the author will need to show that he or she has a thorough knowledge of the market the book will be competing in. The publisher will be interested in knowing what similar books are already on the market, who wrote them, who published them, and how well they have been selling. The publisher will also want to know how this new book will stack up against the competition and in what ways it will offer any new material or fresh ideas. #8 Professional Development. Publishers want to know specific facts about where an author is in his or her career – novice or seasoned professional. The cover letter should include pertinent information such as where or when the author's other books (if any) have been published, which magazines he or she has written articles for, how much byline visibility the author has had in recent years, and what sort of educational training or on-the-job experience the writer has had to enhance his or her writing (and marketing) skills. "One of the biggest advantages for a would-be writer is to have a built-in forum," asserts Linda Konner, former editor of Weight Watcher's Magazine. "When I wrote my first book about diet and exercise, I mentioned in my cover letter that I travel around the country to speak to various organizations about health matters and that I could sell my books at these meetings. I also said that my contact with a leading diet magazine would enable me to have excerpts from my book printed in that periodical. This convinced the publisher that I would be a big help at marketing the new book. I got the contract." This same principle applies to people who do evangelism crusades, lead sales seminars, have their own radio or TV show or serve as lecturers at conventions. Public visibility is important. #9 Legal Concerns. If the author's manuscript will contain photographs, illustrations, maps, cartoons, historical documents, direct quotations from interviews or material from other printed sources, the publisher will want to know if appropriate model release forms and permission-to-quote releases have been secured. We are a litigation crazy society these days, so it pays to secure all the right paperwork. #10 Business Negotiations. A cover letter should mention whether or not a writer will be acting on his or her own behalf or will be later represented by a literary agent or attorney when contract negotiations begin. It's also proper to mention whether the book proposal is being multiple-marketed or just being sent to one publisher at a time. A book proposal is similar to a job interview. If the appearance is neat, the information is interesting and accurate, and the necessary preparation has been done, there's a good chance that the deal will be closed. About Book Proposals That Sell? At the world's largest online bookstore, Amazon.com, Book Proposals That Sell has over 55 Five Star reviews from various customers. --Michael S. Hyatt, President of Thomas Nelson Publishers, ninth largest publisher in the world. With years of experience as an author and an editor, Terry Whalin has written a book that can help any writer. Book Proposals That Sell offers great advice on building the nonfiction proposal and also explains the inner workings of the editor's and publication board's role in acquiring a new book. Novelists, too, will find this background information very helpful. All authors need to understand the uphill battle they face in selling a book before they can be fully prepared to submit their absolute best proposal or manuscript. Whalin's book lays out what they'll face--and then shows them how to win the battle. -- Brandilyn Collins, best-selling novelist. Selling a book may be one of the most intimidating challenges you will ever face. However, an intimate knowledge of the process helps make it easier. Terry Whalin offers his broad knowledge of this business--from both sides of the editor's desk--make him the perfect resource for helping you develop a proposal that sells. If every proposal I received followed the rules of Book Proposals That Sell, my job would be a lot easier! Whalin has produced an indispensable tool that is both practical and powerful. How does one get a foot in the editorial door? Publishers want to see a clear, direct, and well organized book proposal. Without one, most will not get a second chance to make a good first impression. Terry Whalin's excellent how-to advice in Book Proposals That Sell will be of immense value to nonfiction writers of all types. Writers who are serious about getting published need more than talent. They need the inside scoop on what really goes on in publishing. Terry Whalin offers insider information for writers at every level in Book Proposals That Sell. This book is bursting with real life examples and bottom-line advise to create professional proposals that will make editors sit up and take notice. -- Vicki Caruana, teacher and author of the best-selling Apples & Chalkdust. Terry Whalin has written scores of book proposals. And, as an acquisitions editor at two publishing houses, he's read his fair share of proposals. Now he shares his wealth of knowledge in succinct chapters brimming with pointers. In the often bewildering world of book publishing, aspiring authors need more than desire, creative skill, and something worthwhile to say. They also need a road map. My friend Terry Whalin offers a map even Rand-McNally couldn't top. If you have any inclination toward getting a book published, you'll do well by studying this book first. As a former publisher, the truth and insider information from Book Proposals That Sell resonates with my own publishing experiences. Terry Whalin helps would-be authors or experienced writers walk through the critical questions from any acquisitions editor. If you answer these questions, it will help you gain serious consideration for your book idea. As an agent, I've read Terry's nonfiction proposals and have always been impressed. He knows how to put together a winning presentation to capture a potential editor's attention and get a decision. In Book Proposals That Sell, Terry combines his compassion for writers with his considerable publishing experience to create a must-have book for anyone preparing a nonfiction proposal. Many beginning book writers complain that it's harder to write the proposal than the book itself. Until they know how, that's probably true. Terry Whalin knows the secrets of good book proposals. As a writer, he's composed many book proposals; as an editor, he's read hundreds of them. --Cecil Murphey, writer, co-writer, or ghostwriter of more than 100 books including Committed But Flawed and 90 Minutes in Heaven. This is a valuable step-by-step guide to doing a book proposal. It tells would-be authors what agents and editors look for in book proposals, with advice on how you can tailor your book proposal for the market at which you're aiming. Terry Whalin has written an informative book to help people navigate the treacherous waters of getting published. An indispensable tool for new authors. As a successful author and acquisitions editor, Terry Whalin knows why some proposals bring publishers to attention and why others put publishers to sleep. Heed his advice and your next proposal just may be your break-through.